Vol. 11, No. 41 /1963 page 135-137 University of Melbourne. In 1937 Miss Heney was awarded the Degree of M.A. in the University of Sydney for a dissertation entitled „P. E. Strzelecki - Australian Explorer: 1797-1873”. Nearly twenty-five years later she has published In a Dark Glass, the book which purports to be the definitive biography of a man who left Poland at the age of 28 and died in London half a century later as Sir Paul Edmund Strzelecki, K.C.M.C, C.B., F.R.S., F.R.C.S., D.C.L. (OXON.). The dissertation and the book under review are, of course, two very different pieces of writing. But the difference lies not only in the length and the scope of each work; there is a very striking difference in the writer's attitude to her subject. Writing in 1937, fresh from a visit to Poland during which she had access to all the basic documents referring to Strzelecki. … If, a Pole of the Age of Captivity, he missed the two greatest titles in Mickiewicz's famous epitaph, and was neither soldier nor poet, he was at least exile. To that absence from the place where he should have been, for happiness, he added the honourable rank of explorer, scientist and philanthropist, and was a man who without any advantage of birth or chance, with nothing to recommend but himself, in a strange country, created a niche in its social life, a place in its history, and wrote the names of his choosing across a continent”. Elsewhere in her dissertation Miss Heney dwells on Strzelecki's contribution to the exploration of south-eastern Australia and particularly Gippsland and his part in the discovery and exploitation of gold and other minerals. Twenty-five years later Miss Heney contradicts herself and tries to make us believe, as one of her reviewers put it, that „Strzelecki created and lived a lie”, that he did not perform any worthwhile work during the four years in Australia, that he played only a marginal part in the discovery of gold and other minerals, and that he fraudulently endeavoured to take unmerited credit for all his activities. This contrast in the treatment accorded to an historical figure by one author writing at two different points of time is quite astonishing. It is even more astonishing when one finds that Miss Heney, while writing In a Dark Glass, had at her disposal the same basic sources and documents that she examined for her M.A. dissertation, and that two other biographers of Strzelecki who both had access to the same sources (Geoffrey' Rawson and Waclaw Slabczynski) had been unanimous in reaching diametrically different conclusions to those of the author of In a Dark Glass. How can one explain such a treatment of an historical figure by an accomplished writer? One would be tempted to explain it in terms of what P. R. Stephensen described in a recent Commonwealth Literary Fund Lecture as the „colonial attitude” of Australian literature in minimizing the explorations of native-born Australians and foreigners of whom Strzelecki was one. In the opinion of this reviewer, Miss Heney was less concerned with Strzelecki as a foreign explorer than as a person. The whole tenor of the book suggests that the author is bent on placing Strzelecki's portrait in „a dark mirror”. This treatment includes even distortion of documentary proofs, as for example in the case of Strzelecki's exploration of Gippsland. Miss Heney accuses - Strzelecki of presenting himself in his report to the House of Commons (House of Commons Papers, 1841, Vol. 17) as the only pioneer of Gippsland and of only briefly mentioning Macalister's and Buckley's explorations. The original text, however, refers to „Mr. Buckley's and Macalister's cattle stations the first pioneers into Gippsland ” (italics mine). This quotation makes it clear that Strzelecki did pay homage to 'the first pioneers' although they, of course, made no maps and provided no scientific descriptions of the district. But Miss Heney disfigured the sentence from Strzelecki's report and omitted his reference to „the first pioneers into Gippsland”. Her treatment of the part played by Strzelecki in the discovery of gold in Australia (pages 188 and 197) is in exactly the same idiom. The author's knowledge of the Polish history seems flimsy. On page 3 she refers to Kosciuszko's insurrection (1794) as taking place after the third partition of Poland (1795). This sounds like saying that Trafalgar happened after Waterloo. Again on page 12 Miss Heney remarks that the Grand Duchy of Posen (Poznan) had its own army which is not true. Earlier she says that a brother of the Archbishop Jan Strzelecki was sent by King Casmir to „Hungary to negotiate the delicate treaty which put the Hungarian Princess Jadwiga on the throne of Poland” (page 5). Here, Miss Heney's knowledge of Polish history has let her down completely for at the time of the mission Jadwiga had been dead for 25 years and Archbishop Strzelecki's task was to install the Polish Prince on the Hungarian throne. The examples of such inaccuracies could be multiplied. The only person to emerge with credit from this biography is Adyna Turno, the Polish nobleman's daughter with whom Strzelecki had unsuccessfully tried to elope. Miss Heney obviously can't forgive Strzelecki for this and for some forty years keeping up correspondence with the woman and professing his devotion to her. writes Miss Heney (page 207). But to establish this contrast she not only described him in a dark mirror; Strzelecki's portrait, which Miss Heney uses on the dust jacket and as a frontispiece, bears no resemblance to any of the authentic portraits of the explorer. Miss Heney's hero has an ape-like face, silly and rather evil. It seems as if the original face taken from Slabczynski's biography had been changed into a caricature by lead pencil, photographed in a mirror, provided with the signature of Strzelecki and so offered to the reading public to strengthen the main argument of the book. 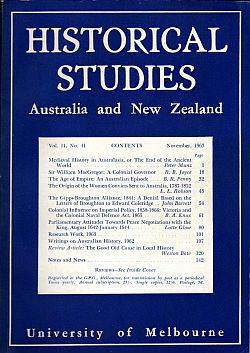 In short: Miss Heney has done great disservice to Australian historiography, her publishers and sponsors. In a Dark Glass. The Story of Paul Edmund Strzelecki. By H. M. E. Heney. Angus and Robertson, Sydney, 1961. Pp. xvi + 255. Illus.45/-.